A beautiful burner designed by Paolo Bonanno and jointly developed with Ultramagic. 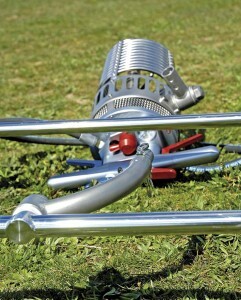 A unique burner system combining main and quiet burner in one valve action giving extra power without an extra weight penalty. 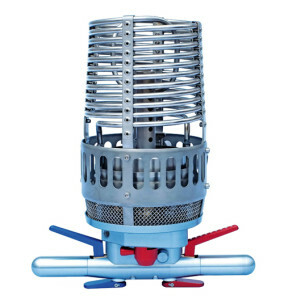 The ultra compact Powerplus Sport single burner complete with frame and hoses weighs only 14Kg and consequently has the highest power to weight ratio of any production balloon burner in the world, whilst still producing an efficient quiet flame. The main valve action has tremendous feel and gives you the option to independently operate the normal main action part of the burner by engaging the first phase only. However if you then press the valve action an extra step you then engage phase two of the burner giving you the “plus” part of Powerplus Sport. The quiet burner can also be activated on its own by the separate valve under the main valve handle. With a complete duel burner system throughout the Powerplus single gives you everything that you need in a burner and more. The Powerplus Sport single is certified for use with Ultramagic balloons from 25,000 cu ft to 120,000 cu ft.
Ultramagic in conjunction with Paolo Bonanno have developed a unique burner assembly system that allows easy removal of a single burner from the load frame. This enables the burner to be stored in a small padded bag for easy transport. This is specially useful when used with compact balloon systems that travel extensively and sometimes by air transport.